The UBC CLF offers 6 default page layout options. These page layouts can be set for all pages at once, or they can be set for each individual page. Note that an individual page's layout will overwrite the default layout set for all pages. 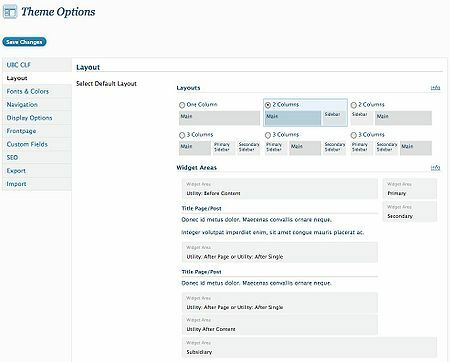 The default page layout can be set so that it is consistent throughout your entire website by selecting one of the 6 default layout options under Appearance > Theme Options > Layout in the WordPress Dashboard. Once you have chosen your layout, click on the "Save Changes" button to save your preferences. The layout you pick will be applied to all pages of your site with the exception of the Frontpage. To customize the layout of the Frontpage, click on the Frontpage tab found under Appearance > Theme Options in the WordPress Dashboard. For more details please refer to this page. You can also customize the layout of a particular page while creating or editing a page by selecting one of the 6 pre-defined layout options under "Page Layout" on the right-hand side of the screen in Edit Page mode.